For ordering information please contact Neil. These drums have been crafted in the Gambia by Momodou Lamin Jeng (see photos on gallery page). They are made with goat skin and bush mango wood and are of a very high standard. They measure approximately 12’ x 24’ and as they are all handmade, the finish and carvings will vary from one drum to another. These drums come from Guinea and were made by Madi Camara. Madi uses either lenke or harre wood to make his djembes and they measure approximately 12’ x 24’. 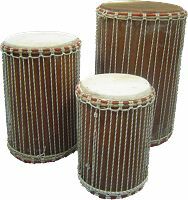 These goat skin drums produce an excellent sound and are of a professional standard. Again, finishes will vary; it’s best to come and have a look at what’s in stock. The largest in the bass drum family, made with bush mango and cow skin. Medium sized bass drum, made with bush mango and cow skin. Small sized bass drum, made with bush mango and cow skin. Cost for set of three: dununba, sangban and kenkeni: €500. These bags are made by a Senegalese tailor in the Gambia. They are padded and strong, offering protection for your drum. They are made with two shoulder straps and two carrying handles and have a plastic lining to protect against moisture. 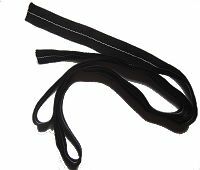 This strap will enable you to play your djembe standing up; it is one piece: 4 metres long and 4cm wide. Segesege rattles are using to enhance the sound of the djembe. They add a percussive buzz and are commonly used by professional drummers. They are available in a variety of different styles.